This statement made by Nora sums the book up for me! I, unfortunately, read this book prior to reading the first book in the series, so it took a few minutes to figure out who is who and why people have 2 different names (still not 100% clear on that TBH). But if this book is 1/2 as good as the first I need to read book one. This book had it all for me. I went in blind like I often do (that may be why I didn’t see that it was a series), but regardless of reading book one – I was able to jump in and fall in love with this author and her characters. I can see why Anna Todd is a Wattpad sensation! Her writing was flawless, her characters complex and her style of writing sucked me in and wouldn’t let go. The alternating point of view is one of my favorite ways to read a book. 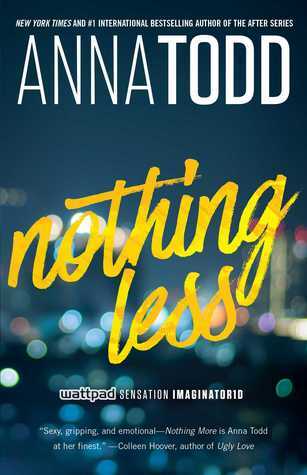 Ms. Todd has given us Nora’s thoughts and feelings as well as Landon’s which makes the book complete. There is no guess what the other is thinking so the reading experience for me is pure. Just a great easy and fun read! With a hint of angst thrown in for good measure!! I guess I need to grab Nothing More and find out a little more of my latest book boyfriend Landon! I think it can be read as a standalone but honestly – get Nothing More first and I think you will enjoy it even more!